All suited up in London, David Gandy out and about. THIS season there was such a broad spectrum of looks for men ranging from the sharp tailoring of long established London brands to quirky styles and streetwear from emerging design talents. 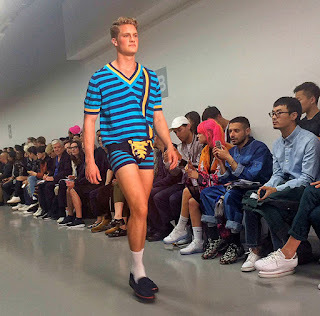 There were a few key trends that we noted on the men's runways that stood out in London in contrast to the shows in Milan and Paris. We round up some of the summer essentials for men with some tips on how to wear them. Shirts off? Revealing designs that showed off men's chests on the catwalk were one of the strong looks this season. Rory Parnell-Mooney at the MAN collection had tops with angular peep holes exposing model’s torso. 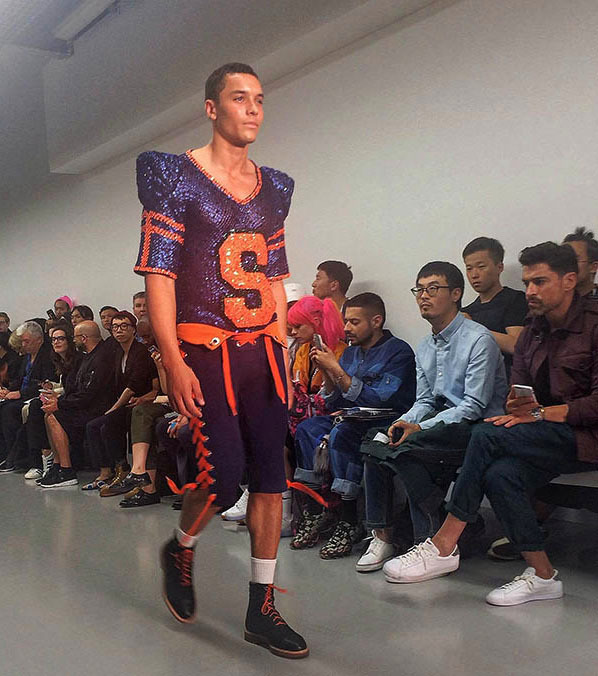 American jocks featured at Sibling. 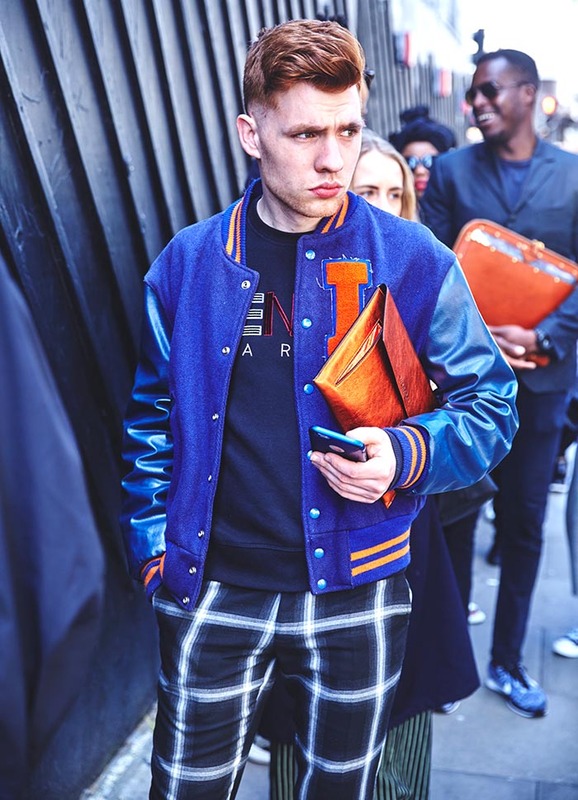 One of the standout trends among the street style looks and fashion show attendees was the man clutch as a practical yet stylish accessory that is clearly replacing the man bag, the backpack or the heavy holdall. On the catwalks the interpretation was quite different, proving that sometimes form wins over function. A good example is the J.W. Anderson collection, Boy in Space, that had a feminine aesthetic. 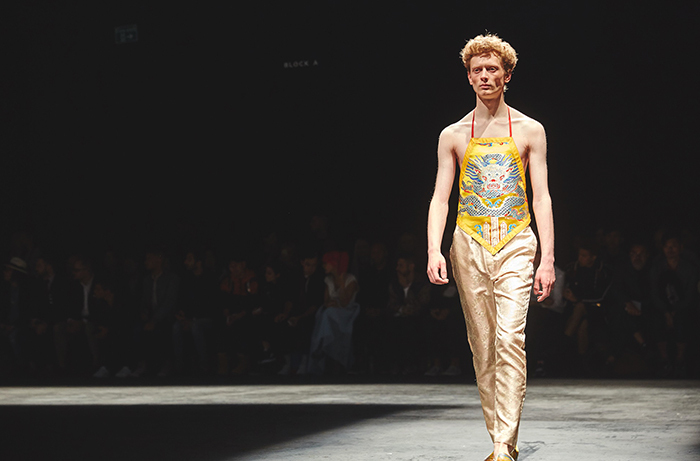 Partly inspired by David Bowie, the collection played with gender, just like the legendary pop star. J.W Anderson presented coiled-metal structured bags with hanging utilities such as bottle openers and key chains that were teamed with an 80’s vibe such as over sized collars on shirts, leather trench coats and high-waisted trousers. 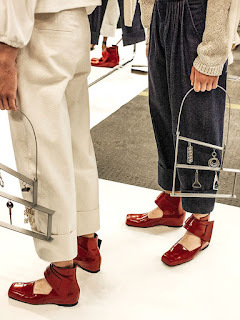 The models wore patent red scarlet flats that definitely stood out and gave the finishing touch to the overall feminine look. Big rucksacks & bags at Christopher Raeburn. Whereas designer Christopher Raeburn took inspiration from the island of Borneo featuring large orangutan rucksacks. These were a striking new interpretation of his animal bags and a percentage of each bag sold will be donated to the Orangutan Foundation. 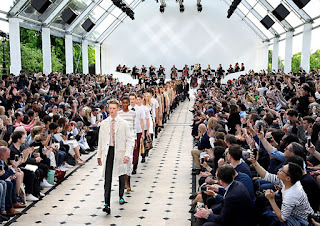 Burberry’s CEO and creative director, Christopher Bailey, presented a lace-inspired collection for men for his SS16 collection with a strong accessory range including the Barrow: a men’s document case with a high-shine patent leather finish in different materials and colours. There were also alligator document folders and raffia clutches teamed with Scottish cashmere scarves, bug tie pins and tassel loafers. Prints and TechnicolourPrints and patterns were strong looks at the last Autumn/Winter 2015 collections. This season they were loud, lively and often made up of an eccentric mix of colours and designs. 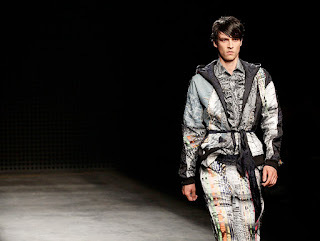 House of Holland, a previously exclusively women’s clothing brand, launched its first menswear collection this season. Designed by Henry Holland, in collaboration with photographer Martin Parr, the colourful and fun collection fused sportswear in technical fabrics with more traditional tailoring techniques. James Long's stylish collection with touches of neon. Influenced by ’90’s rave culture, a standout look in the collection was a matching two-piece yellow tracksuit. 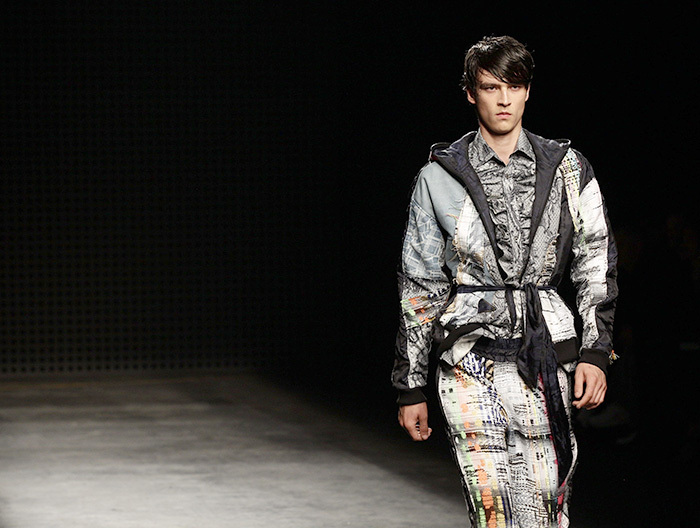 Dizzingly patterned bold prints in clashing colours were a big part of the new collection. 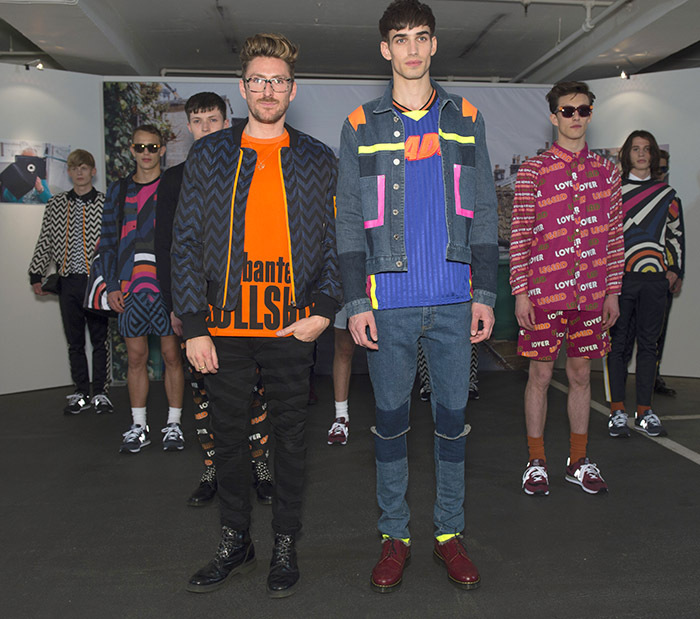 Kit Neale’s show mixed psychedelic patterns with vivid colours and clashing prints. Splashes of lime green and yellow, pink and blue and silks in burnt orange and red. Accessories included lavish Bernstock Sperids 90's bucket hats and earrings. Alexander McQueen's show featured nautical motifs. 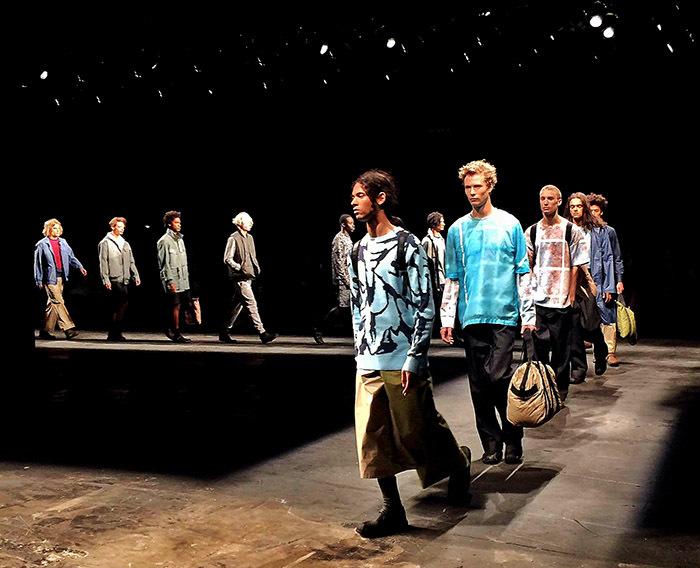 Creative freedom was at the heart of James Long’s SS16 collection with paisley prints and bright colours. 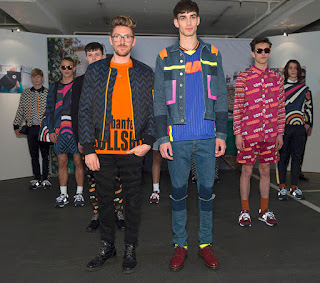 Outstanding pieces included a wonderful denim patchwork jacket, sweatshirts and trackpants emblazoned in a neon scribble print especially drawn by James Davison. The Alexander McQueen collection, inspired by The Tempest and Rime of the Ancient Mariner, moved further away from last season’s painterly themes to more geometric designs with a nautical motif. 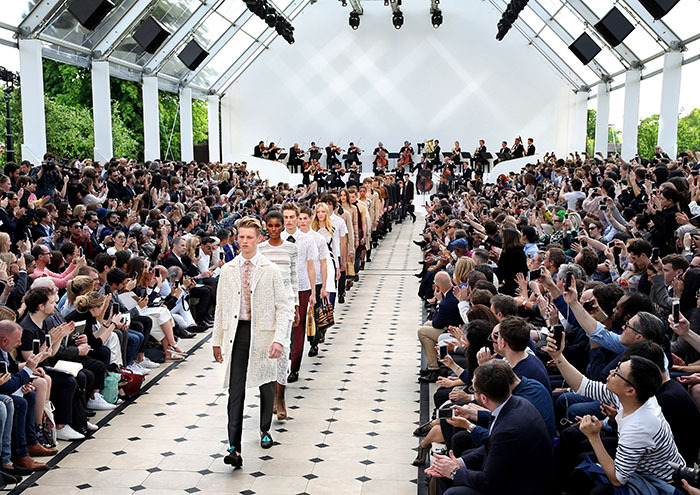 “It was about the idea of being at sea and having a sense of belonging there, of identifying yourself through the sea,” said Sarah Burton, the brand's creative director. 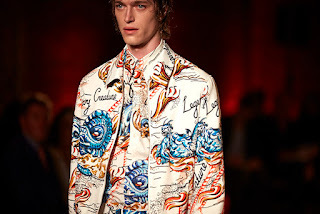 Nautical tattoo motifs were incorporated onto suits and jackets with classic men’s silhouettes. Pieces included slim-fitting dinner jackets, pyjama-style shirts, asymmetric knitted sweaters and suits patterned in ship’s camouflage. While prints and embellishments were key to the collection, the colour palette was quite a subtle one including black, off-white, navy blue, aqua and orange. The bold, oriental collection by Xander Zhou. 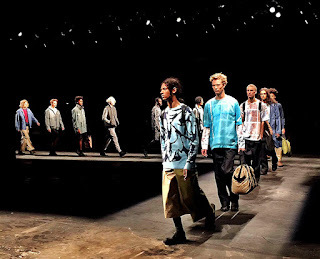 The East has arrived Oriental silhouettes and prints were a key theme this season, including the bold collection of Beijing-based menswear designer Xander Zhou: “The East has arrived. Salute and embrace it,” he declared. The designer explored symbols and signs and presented unexpected twists using Chinese embroidery: felt biker jackets decorated with silk flowers and contrasting quilted pockets in a digital print. While eastern inspiration was very evident, the expression of London street style in the 80’s was also a part of the designer’s inspiration, proving once more that it is as much relevant now as it was then. A key material this season was the use of suede in many of the collections. 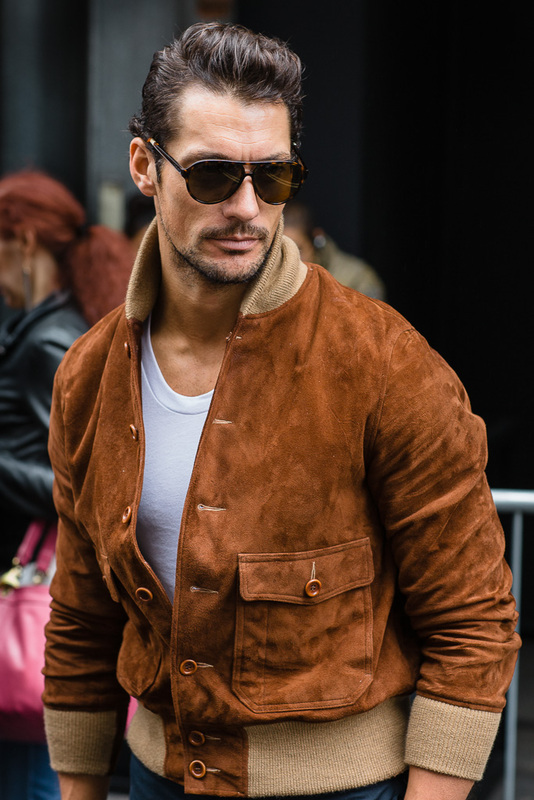 A good suede jacket will be a wise investment this year and always adds a luxurious feel to an outfit whether it is biker, bomber or anorak in style. Even though outerwear wasn’t a big part of the spring summer collection, in places like London jackets are still a part of our wardrobe even in June. In the front rows of the LCM fashion show, Nickolas Grimshaw, Tinie Tempah and David Gandy, were all spotted wearing suede. Up until a few seasons ago, it was all about being minimal in menswear, preferably in a flat range of white, black and grey. But it is obvious now that prints are here to stay. One thing that is making its way back to the men’s wardrobe is the graphic t-shirt. Always an easy way to make a statement, many designers are creating t-shirts to emphasise their collection’s theme and to express themselves. Wearing prints is one of those looks that needs to be worn with caution. To work this trend into your everyday wardrobe try to wear one piece with large patterns rather a cacophony of styles. If you do decide to mix patterns, as seen on the catwalks, try to make sure the prints contrast but complement each other: pair motifs that differ either in pattern or tone but not in both. Socks made a comeback at Sibling SS16. For the last few seasons, we could see the “mankle” everywhere – and it was becoming acceptable wearing formal footwear with no socks. Plus cropped trousers. Spring/Summer 2016 sees the return of the sock. This could be seen at the Lou Dalton and Christopher Raeburn and even socks and sandals were on the runway at Margaret Howell. Suit, pattern & colour on Kadu Dantas. For a bolder, fun look, wear a pair of colourful socks. As always, we can’t wait to see how the trends of this season will translate into our everyday wardrobe. 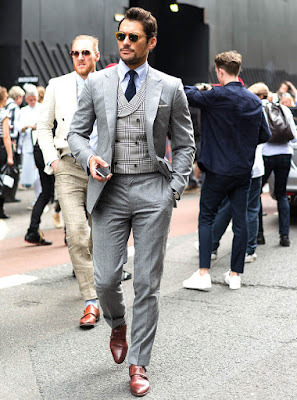 The street style looks showed a lot of the trends, mixing up patterns and bright colour along with classic looks such as the stylish British tailored suit as worn by David Gandy and Kadu Dantas. We will leave you with one last styling tip - the SS16 suit has a real individuality and an element of eccentricity and a more casual form instead of being formal and traditional. Add a dash of colour in the choice of tie, cravat or textile broach and choose a subtle checked or striped pattern for the suit itself. Add a dashing sun hat and a pair of retro sunglasses and you have an outfit for every summer occasion. See you next season!